Do we want good children or godly children? This question lies at the heart of our true desire for our children. In the midst of a secular society, it is easy to leave God out of the training of our children. For any child to be a “good” child he must be raised by God’s truth, even if the parents do not acknowledge they are doing so. They enjoy His world, His gifts such as life and bodies but do not give any thanks to Him. This is the mark of the secular state that asserts it can run on its own. We want godly children who know the principles of good living but also who know God Himself. We desire for our children to have a love and passion for God that overflows in a love for mankind. Without Jesus Christ our ability to forgive, have compassion and to love is greatly limited. In Christ we have the ability to have Christ live His life in us. Our goals for our children must go far beyond what we can do in our own strength, which only feeds our pride. We must train our children to trust God and live a supernatural life in which they walk in His Spirit. There are many voices telling us how to parent, but the majority of them reject God’s purpose for our children. Because many Christian families have bought into secular thinking, their children are living as immorally as the society around them. Now is the time to change the course of history through our own families. God can do great and mighty things through a small number of families that live by His great and glorious promises and purposes. In this session, we will first focus on God’s principles for raising our children from Deuteronomy 6 and later conclude by mentioning some practical points on how we can implement these life-changing principles. In the chapter before this, the Ten Commandments were clearly given to the people again. God is holy; therefore we must do things His way in order to please Him. Therefore, we must know what the Lord says and then actually obey Him by doing just what He says. Moses taught the Israelites God’s commands in order help them live out godly lives among the heathen nations. Our standards must come from God’s standards. As these commands have been taught to us, we need to teach them to others. God wants us to think in terms of generations. We are not only to think of our children but our children’ s children. The ‘you,’ ‘your sons,’ and ‘your grandson’ reflect three generations. What we do with our lives greatly impacts the lives of the next generations. The ‘fear of the LORD’ is the conscious presence of God, which influences our lives. Many people live their daily life as if God has nothing to say about how they should live. 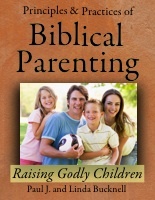 Take a look at our new book, Principles and Practices of Biblical Parenting: Raising Godly Children. Check out the BFF Resource Center for this book and many other helpful and relevant resources (308 pages). Great for a Parenting Class! You can purchase our parenting, marriage and other articles, handouts, videos at our store! When God’s Word has minimum impact on what a person does, we can say he is secularized even though he might be religious. The ‘ fear of God’ is no longer in his life. Our purpose is not just to pass down the LORD’s commands but that our children might fear the LORD and keep His commands. Knowledge of His commands is insufficient. Knowledge must be translated into life change. If a generation only has knowledge of His commands and no love for His ways (this is where Christianity has degenerated into a mere religion), then the next generation will depart from those commands. How do we avoid this generational departure? Parents must pass on the fear of the LORD to their children and children’s children. The Christian parent must do everything to pass on the heart and passion for the Lord as well as knowledge of the Lord’s commands. On the positive side, if we live out godly lives before our children, they will most likely pick up that passion. We must be careful to instruct them about who the Lord is and all about His ways. Neglect of this will lead to a next generation that has respect for our ways but no power. If we live compromising lives, then we live as if we are already in the second generational stage. Our children will, for the most part, leave the Lord. They do not believe because we do not really believe. Genuine faith always touches our life’s priorities. Only a false religious faith permits a division between ‘belief’ and life. Our children look at the goodness of our lives rather than what we say. They are right. If we do not live by what we say, then they see only our hypocrisy. This produces sad and bitter lives. Pause for Reflection: Are you excited about what God is doing in your life? If so, have you shared it with your children. If not, do you really expect your children’s zeal will be above yours? And He will love you and bless you and multiply you; He will also bless the fruit of your womb (Deuteronomy 7:13). We will either believe our welfare is dependent upon keeping God’ s Word or we will not. To the degree we obey, we will be blessed. Our goal should be to ‘run’ after His commands. Only in this way do we have a passionate love for God that would be worthy to transfer to the next generation. Since the Lord is one, we must not divide our affections between Him and something else. If there were several gods, then our loyalty would be divided. Since He is one, all of our devotion, inspiration and strength must be used to do all that He says. His words take a priority in our lives. God is asking, even demanding, that we take all of our work, family, and personal plans and re-work them so that He becomes the center of our lives. A doctor, for example, should give up his occupation if he is required to do abortions. He should not murder. The commitment to life requires him to help not hurt people. Jesus told us that we could only love Him or wealth (mammon) (Matthew 6:24). If a family worships money, then their decisions will be made with those prior commitments in mind. In the end, we will only prioritize one God. We need to commit to serving the LORD Yahweh as a family. This decision sets our family apart from others. This is important to communicate to our children. Pause for Reflection: Is God your life priority? If things got real bad like Job, would you give up God? We fool ourselves if we think that we can raise our children to become godly men and women without having a passion for God and His Word ourselves. His words must be on our heart. We can judge our commitment by discerning how much time we spend keeping God’ s Word fresh on our hearts and minds. When we do spend time in His Word, is it because we desire His Word or because we are obligated to. We do go through ups and downs in our spiritual life, but the real test is how much we really love God through all those times. Pause for Reflection: How many times do you as the father meditate on God’s Word through the week? The BFF Family DVD has all theBiblical Parenting Principles for Toddlers materials in printable form as well as the available Powerpoint slideshows and handouts for each session. Click the DVD for more information. The many practical training materials supplied on this one DVD can’t be found elsewhere.More info. There are two commands here. First, we are instructed to “teach them diligently to our sons.” This describes formal teaching. Secondly we are to “talk of” His ways. This is informal teaching. The father is responsible for diligently teaching his sons. Interestingly, we do not see God charging pastors, elders or Sunday School teachers to do this. We must, therefore, refuse any tendency to pass off our responsibility as fathers to formally teach our children. Instead, we are to embrace our responsibility as a charge from God. What are we to do as fathers? We need to teach God’s Words diligently to our sons. The content of our instruction is God’ s words or commands. We need to teach them both the positive and negative commands. Since many of the commands are set within the contexts of interesting historical situations, we are also to recite those narratives. The Lord brings that ‘God-conscious’ perspective to our children through us as fathers. This in turn brings great blessing to our lives. With a little observation of the typical Christian father, we can see why many children of Christian families go wayward. The fathers simply don’t teach their children. Some children have heard their fathers teach others but not themselves. Actually, I myself didn’t get a hold of this truth until recently when I was pondering how my children were going to be any differently prepared to face the wild world out there than other children. It was then that I realized that though I personally discipled others, I did not disciple my own children one on one. I knew the advantage of personal discipleship but would not apply it to my own situation. I was humbled by my neglect of personally meeting with my two older daughters. I decided I would start meeting regularly with my oldest son and teach him God’s Word. After I had understood more of the procedure and need, I expanded to meeting personally with each of my young children that can read.3 I did not totally neglect my older children. We have had family devotions each night since the beginning, but this personal formal input of God’s word into their lives has become a very important building time. Another obstacle for fathers is the notion that they are not gifted teachers. In other words, they believe that only the few gifted teachers can teach. It is urgent that we reject this need for fathers to be gifted teachers to instruct their children. Let us ask what the Word of God asks of us fathers. Does He our Lord not teach us that we should love His Word and teach our sons? Yes. Then lets not let this notion of being a gifted teacher get in the way. If we expose ourselves regularly to God and His Word, then He Himself will give us things to teach. We can teach what He teaches us. Along with this wrong notion is the thought that only those trained in seminaries can rightfully teach doctrine. This is nonsense. Again, it goes clearly against what we have learned from this charge to fathers. Fathers are responsible to teach their sons. Ephesians 4 actually tells us that pastors and teachers are to equip God’s people. This means that God charges pastors and teachers to exhort and instruct God’s people. Among them are many fathers. These fathers are then to instruct their children. Fathers are responsible to teach their own children. Every father has to work out this formal instruction. Without it the children will be missing out. We have chosen to home school. This gives us even more opportunities to instruct our children using God’s Word rather than secular curriculum. Pause for Reflection: What formal teaching of God’s Word do you bring to your family as the father? How much time? Where? To whom? And shall talk of them when you sit in your house and when you walk by the way and when you lie down and when you rise up. (Deuteronomy 6:7). This passage catches fathers off guard. Some fathers do have family devotions with their children, but many are too busy to spend any significant time engaging in worthwhile conversation with their sons. This whole approach works only if the father really loves God with his whole heart, mind and with all his strength. This passion for God is normal. Anything else is backsliding. Yesterday, for example, my head was extremely congested with allergies. I hurt but my heart was joyful. When I lay down, I thought about my Lord and His love to me. Later I shared with my children how the Lord kept me from complaining or doubting His care for me during this time. We must share our life experiences with our children. When should a father do this? The passage gives us four settings. 1. Sitting down in your house. Some dads make themselves too busy watching television, surfing the web, and going to sports events to spend significant time with their children. Others have the time, but the Lord is not on their hearts. They will talk excitedly about some soccer match, some recent purchase or about some project that they are working on. Their main project should be to know God and His Word. This lack of passion becomes obvious to their sons and daughters. Their hearts go somewhere else but not to Lord. They are only doing what Dad does. 2. Walking somewhere (today driving or riding). Often times the father listens to music or some radio show that distracts from conversation. The children love to talk and ask about things. Do you ask them about their day? Do you like to talk to them? They really like to talk to you. 3. Lying down (getting ready for bed). In the old days, houses were smaller. Sometimes guys would sleep in one room while the girls in another. This provided a lot of opportunities to share. I remember some of my good conversations with our Dad happened when camping together. Just before going to sleep we talked a bit. If children have their own bedrooms, then the parent should pause and talk with each child before they go asleep. Recount the day a bit. Give them a hug and kiss. 4. Getting up (early in the morning). The morning sets the pace and attitude of the day. The father should share some reflections from his morning devotions or say some statements that help the children properly look at each day. The father should be an early riser so that he can help encourage the family when they get up. Everyday we face many situations through which the Lord wishes to teach us and then pass those lessons on to our children. We have moved our television to the third floor attic. No cable. They can barely see three stations. It does not distract from our times together downstairs. Mealtimes are another great opportunity to share about what one is learning. We must remind you that informal teaching is not to be the only kind of teaching. It must be a good companion to formal teaching. We surround ourselves with what we love. If we love God’s Word then it will be all around us. We can put scripture on our computer screens, walls, plaques, etc. We should throw away some of those old items that show our old treasures and replace them with our growing love of God’s Word. Throw away those Buddha statues and anything else associated with different religions. Take down those pictures of movie and sports idols. If pictures are depressing, replace them with one from Psalm 23. More than this memorize these verses with your children and learn to treasure them. The best place to store God’s Word is in our heart. What is on our walls should only reflect what is in our hearts. We put scripture about our home not because it is mandatory but because that is what we like. Pause for Reflection: What do you decorate your walls with? Would anyone know that you have a great love for God from walking in or around your home? Dads need to rethink their calling from God. They are not just husbands; they are fathers. They need to lead and teach. It is from such verses as Deuteronomy 6 we understand the true importance of the family to a great society. When the family disintegrates, the society dies. When the family is strong and fathers take the lead, the society does well. Will we fathers begin to take our role seriously or let our children be drugged by modern teachings and be caught by the pull of the secular world culture? Our response to God’ s charge shows our answer. Family devotions is a name for the structured time a family regularly gets together before the Lord. Although most people now seem to think more in terms of ‘cell’ groups, family devotions or the ‘family altar’ is the age old small group meeting. Families now are so small and people dispersed from their families, we need to create artificial group meetings. We have no problem with the later groups but they should again remind the father of the importance of formally teaching his children. The family must regularly group around the father to learn of his love and knowledge of God. Like personal devotions, family devotions often have singing, memorizing and discussion of God’s Word, prayer and sharing. The more personally it is related to their lives, the more helpful the time is. We will not go into details on how to conduct family devotions but deal with some more concrete issues that parents of toddlers might have. Devotions should begin before the children are born! That is right. At that time it will only be the husband and wife assuming no other relatives are present. Once the first child comes, the whole family passes through a transition time for about 3 months. It is important for devotions between the husband and wife to continue as much as possible even if it is a brief ten minutes. My wife and I personally pray and share each night as a couple. We don’t watch television but talk and pray. This does take a commitment of time but think of the benefits. We don’t fight. We are a harmonious couple. We love our marriage. We save a lot of time that would otherwise be spent in aggravation, worries, and fears. When the child can sit up, it is time to start devotions with our child. My wife and I still meet separately though. We like to. We cannot share on the depth that is needed during family devotions. With our children, we need to carry on at a different level of conversation and focus. We sing both simple children’s songs as well as old hymns. Little children love to join in even if they do not know the words. They clap or move their bodies. Before children can read, they can learn to sing hymns together. We simply need to train them. Repeat more often. Have them repeat some words after you. Their memories are fantastic. If we find a child not singing (a bit older) a familiar song, it is not because they do not know the song, but because they are showing ‘quiet’ rebellion. They are choosing not to sing. If we want them to sing, then we should have them sing with us. They might need to be chastised otherwise their rebellious spirit spoils the worship atmosphere. We want the children to learn God’ s Word. We read, quote, and sing God’ s Word. Our real purpose is to get us to think about what God’ s Word says. Some use books to help them such as Bible storybooks. Use those as extra reading material. It is better to focus on a theme for a month. Memorize some appropriate verses. Discuss them. Read other applicable verses. With search programs on the web, one can do a search on patience (which we are doing this month) in a flash and have a whole list of passages to work on. We especially like the virtue theme calendar that gives us a Christian theme for each month for the whole family to work on.5 On a little different level, there are catechism questions and answers for children to memorize. We have preferred to discuss these doctrinal topics as they come up, but it is good to supplement and enrich what we know about God’ s Word. A child is capable of memorizing a great amount of scripture verses. It would be a shame if we did not believe this and act upon it. Sure the parents must memorize along with them, but this is okay. Why not get God’s Word in them early so it shapes them. They do not need to know its meaning. They will learn that later on. Certainly it is up to the parent to decide what is best, but they can memorize chapters of appropriate verses along with choice ones. We usually review them at devotions time. Our children can quote Psalm 1, 23 and 100. This is easy for them (and harder for Dad whose memory is going!) Should we stop there? No. We keep going on and on. Here are some practical points. Have a folder for each older child. Keep the verses printed out that the family has memorized together. We also keep the hymns we have learned together. Bilingual families can learn some in Chinese and some in English. Make it fun. I remember after learning Galatians 5:22-23, we would often go around each saying one word of the verses which would emphasize the fruit of the Spirit. Pause for Reflection: What verses have your family learned so far? Which ones do you think they should know? How do you get your child to sit still during devotions? The time for prayer is the most difficult. But if we start early, then even that trouble is somewhat eliminated. For example, when the child is an infant the mother holds the baby’s hands and gives thanks before feeding the baby. Once in the highchair the same thing happens. During devotions, I always liked to take the youngest one and hold him or her in my lap and hold his hands. When the baby has learned to fold hands during prayer, they need to go through a time of keeping them folded. If they resist, we just go back to holding them again. We cannot force a child to be quiet, but we can help them sit still. For example, toddlers will sit with Daddy or Mommy. When they are able to start wiggling around, I hold them tight in my crossed legs. Unlike church, we can ignore their baby sounds. This really depends on how old the child is. It is proper to teach children to confess their sins, ask God for help and encourage them to pray for others. We do encourage this but realize God cannot hear their prayers before they know Christ as their Lord and Savior. We, however, are praying with them and God does hear us. Prayer is a privilege for Christians. We take prayer requests. The children are great at remembering special needs. We pray for missionaries. Make sure you have some missionary focus as a family. We never dare just pray for ourselves. The Lord wants to do greater things through us when we pray for others. Devotions can be shortened for nights when children are sick or tired. If you come home late, just pray for them with a hand on them while they are in bed. This is not a legalistic matter but one in which you can seek God’ s blessing on your family and instruct them in your love for God and His Word. Let’s now take a look at some other specific aspects of nurturing our family with spiritual teachings. Each child is special. Each one has its own voice, facial shaping, body size, palm prints and even finger prints. We should have a special prayer for each child. The prayer is not magical; it is an earnest plea from the parent for the child to help the child to be all he or she should be. This prayer is a growing prayer. As we see the child grow, we are aware of different gifts and challenges that particular child will have in life. We need to sharpen our focus and prayers for that child. Usually we see strengths and weaknesses in each child. We should encourage them and pray for them that they would overcome the sin and bodily weakness and fulfill God’s good plans. We specially equip them with verses we have memorized with them. As in most people, there usually is one predominant sin pattern in each person. As parents we need to realize that this is the child’s biggest enemy to becoming a godly person. Our prayers serve as their shield as long as we live. By having such observations and prayers, we again are full of expectations that the child will be a godly person, full of the Spirit of Christ. We have found it helpful to focus on the name that we have given them, much like the scriptures do. What does it mean? Why were you inspired to give it to him or her? Pray for a godly fulfillment of that name. Some wonder why Deuteronomy 6, Ephesians 6 and other passages address the father and his spiritual responsibility in bringing up the child before the Lord but do not mention the mother. This is because the father is the responsible one. We can see this in verse 4 by the special way fathers are addressed. Father’s are head of the home. We do also see, however, that he is not the only one active in shaping the child’ s life. In verse 1 we see that children are to obey their parents. There is no distinction between father and mother. This is reaffirmed in verse 2 in case we would have any doubts. Respect and honor are connected to commands and wishes. Generally we see the mother’s care for the child’s nurturing when small6, but the father must see to it that instruction in the Lord and the whole discipline process is implemented. The wife works with the husband to help implement his goals. The wife has special insight and ability to help the children. The good father knows this and works closely with his wife. Notice how the wife is expected to operate in the home. The children should gain a great experience of warmth and love from their mothers. This does not mean they do not chastise. Chastisement is a sign of love. Any child that gives a mother great difficulty should be told that his father will finish speaking to him upon his return. A wife, however, dare not pass all such rebukes and instructions on to the father. Surely the father does not have the advantage of the timing and understanding of the context to get the greatest advantage in training the child. A mother should be the main expression of tender love. She needs to remember this. Father and mother work together in harmony as one. We can understand a mother’s influence even more when we read the scriptures related to a Christian mother with an unbelieving husband. In some marriages one is a Christian and one an unbeliever. Such believing mothers should not lose hope. A godly grandmother and mother raised Timothy. He became a great pastor in the early church. Later we read that Timothy got his understanding of the scriptures from them. For the unbelieving husband is sanctified through his wife, and the unbelieving wife is sanctified through her believing husband; for otherwise your children are unclean, but now they are holy. As long as the unbelieving husband (or wife) is willing to stay with the believing spouse, the believing spouse can have great impact on an otherwise lost child. We need to think beyond just the goal of the child. As we look through the scriptures we find that God does great things through families. Children are seen as a multiplication or expansion of what the parents stand for. As Christian parents, we must reject a pure individualistic perspective and understand that God wants to perpetuate our ministry, vision, love, etc. through our children. For example, if we see that a couple is hospitable, more than likely the children will learn to be so. We can see the compassion, care and love through the parents, but we can see it through the children in the way that they imitate their parents. We do not mean that parents should force careers and positions upon their children, but that there should be a general expectation of how the Lord will be working in ones children. This should encourage us to set up a good positive model so that our children will pass on those great things to others. Take a look at Abraham, Isaac and Jacob’s lives. Note how they have disharmonious marriages and how this negatively affected their children. We can also note on a positive side how their faith in the Lord held firm. They held onto the land and the promises of the Lord. We need to be cautious, though. Children will not only pass on the good but also the bad as they grow up. While we have time, we can confess our sins and have the Lord’s strength to change. This encourages even older children that have already been affected by bad modeling. If the parents have changed, they know they need to change also. The clearer we are on these matters, the easier it is to go forward developing this purpose and sharing it with our children. “Do you know how our great God uses our family? He has used us to help poor people who live near us. Let me tell you about one family.” This sharing instills a great vision that goes beyond an individual perspective that is centered on the Lord’ s purposes rather than in money or position. Pause for Reflection: What is the Lord doing through your life as a family? What gifts do you have? How does the Lord bring His grace to others through you as parents? Although we have said it before in the seminar, we should mention it once more. We as parents are not just passing on negative admonitions. Truly they are necessary. Our children are not to lie. But we must go beyond this and tell them what good things they are to do instead! The more we can focus on the good things, all encompassed in that one command to “love our neighbor as ourselves,” the more we can instill a vision for the virtue that we want to build in our children. These positive instructions become the child’ s road to walk on. A child cannot live by ignoring these things. They will wonder what positive things they should be doing. We should give them answers to that important question or they will look elsewhere. Let me give you an example. I just heard our 3-year–old crying because he wanted something that another brother had. I told him that he was not to cry to get things that he wanted. But after that, I went on and told him what I did expect. I first got his attention to make sure he was listening. I told him that I expected him to share things with others and play nicely. This is how we ended our conversation. This is what I want him to remember. Pause for Reflection: List the positive instructions that you have given to your child in the last week. Please remember that this can only be effectively done when the child can start to understand and reason, but we can start training ourselves! Every child needs to come to know the Lord. Remember that a child should respect both God and their parents. We can train even a non-Christian child to do this. But to love God and love others requires the power of the Gospel. Children are born with a sinful nature. They are sinners by virtue of being born to sinful parents. We parents are sinful because of our sinful parents. And it goes on and on this way until we go back to Adam. Paul summarizes it well in Romans speaking of Adam. When Adam sinned the whole human race was contaminated. All people everywhere need to be saved. Young children need to be saved too. People do not come to a point where they become morally responsible and then need to be saved. They are born sinners as it says above.7 The process of salvation is the same with all people, but special care is needed for children because they respect their parents and desire to please them. This desire to please the parents is not the same as being saved. Sometimes we equate salvation with a decision. The problem with this is that there are different parts of a decision. A decision includes the mind, will and emotions. When a child feels he needs to please his Dad or his pastor, he might say that he wants to be a Christian or nod his head to their plea to be saved. This is probably just an emotional decision. They might not be saved at all. Instead we should look for other signs of salvation. We should first speak clearly of their fallen state and need to be saved from the wrath of God. We need to point out the child’s sins to him. We do not do this accusingly but as a matter of fact. We should remind him just for that sin of lying alone he would go to hell. We are not exaggerating matters but just telling them the truth. Early on they will understand this and equate their guilt with the displeasure of God. We must not force them to say they are Christians. This does not change their heart. We are looking for an awareness of their own sinfulness. We should see a repentant spirit about them. They should be asking questions about the Lord, heaven and hell on their own. Then we know that the Spirit of God is working. We can encourage the child to believe by saying things like, “I hope that you soon become a Christian. You wouldn’t want to live without the Lord.” Right now, my four youngest children, I believe, are not Christians. But they know I still love them. They hear how I pray for them to come to know Him. They know becoming a Christian is the best thing in life. I could easily convince them to say a sinner’s prayer but that does not save them. They need the Holy Spirit to convict them of their sin so that they would seek salvation and the cross. Unfortunately the word ‘decision’ has become a replacement for ‘repent and believe in Christ.’ We need to return to that basis. Notice the power of God at work in salvation in the following verses. Repentance is a spiritual conviction from God that a person’s sins are the most dreadful curse upon him and deserve the condemnation of God and thus seeks a way to escape from them. When our children are trained right, we see a lot of good in them. Don’t think this is the same as salvation. It is not. In fact, it can lead to great deception if the parent believes it is the same. The parent will convince the child and the pastor that they are saved when they are not. The child will have the form of a Christian but not the heart. Repentance and belief go together. The child must believe or know that Christ is their Savior. God will give them this faith. It is not the mere knowledge that Christ died on the cross for their sins but a deep confidence that this Savior indeed has saved them from their dreadful sins. Even the best of children under conviction know they are wicked sinners deserving judgment. Pause for Reflection: Which of your children are saved? Have you seen them go through this repentance and belief stages? A parent should have goals of raising godly children. We should hope that in their childhood that they come to know God through the Lord Jesus Christ. We should also expect that they have a sense of love for God and the ways of God. They should develop regular personal devotions such as reading the Bible, praying and worshiping God. A parent could insist that the children maintain these habits. We refrain from imposing them upon our children unless they come to know the Lord. We as Christian parents do these things but prayerfully wait for God to stir their own hearts. We want to see them respond to God not to us. They will see what to do by noticing us in our private devotion times. You will help them to have good routines so that they can learn to have regular devotions to seek God on their own. The parent should carefully listen to their children’s prayers during family devotions to see if there are thanks, worship, asking for forgiveness and mission (praying for the needs and salvation of others). This is part of the instruction that a father can give. Family devotions is mandatory; personal devotions is to be something they express to the Lord on their own. We want to see them respond to God not to us. Our secular society has so shaped our concepts that many Christians read the Bible as a book rather than the Word of God. They do not even know the difference. They have not learned how to listen to God through their readings of His Word. As parents eagerly seek God in His Word, they will find Him and can share those experiences with their children. In this way, they pass down their spiritual inheritance. In summary, we should remember that a godly child is more than a virtuous child or well-trained child. A godly child has those qualities, but he also has a great affection for God, His Word and His ways. We should pray, train and seek God’ s work in our child that they would love God from the heart and not only conform to His ways. Pause for Reflection: Are your children godly? What makes you think that is so? Are you praying for them regularly for this? There is no doubt that spiritual instruction stands as one of the most important aspects to parenting. How tragic that it goes as the most neglected aspect of parenting! May God give each parent grace to be faithful. May He call up fathers who will be bold in their stand to train their children in the love and ways of the Lord. * God expects the fathers to take charge of spiritual instruction in the home. * The whole family is commanded to love God with all their heart soul, mind and strength. * The father’ s love, obedience and zeal for the Lord will greatly impact the family. * The wife assists the husband in carrying out his responsibilities. * There are two ways a father must instruct his children about the Lord: formally and informally. * Family devotions are important and necessary to train the children and inspire them in their worship of the Lord. * Parents should point out to their children their need and the way of salvation but wait for God to stir their hearts unto repentance. * The parents should pray about each child’ s future and pray that as a godly child they would grow to fulfill God’ s purpose. 1. Who is in charge of instructing the child in the Lord? Why? 2. In what two main ways is this person to carry out this spiritual duty? 3. Why is it that many children leave the Lord? 4. Is living a good life the same as being saved? Why or why not? 5. Why are family devotions so important? 6. What are three things that should occur during family devotions? 7. Should parents press their children to have personal devotions? Why or why not? 8. How should a parent learn to pray for his or her child? 9. What should a parent look for in the child when trying to discern whether a child is close to salvation?